BusinessWebMap from TexMobile is directed toward a specific type of user - the “on-the-Road-Warrior” who routinely drives to a series of stops or worksites and needs to do that efficiently and with documentation. Unlike most mapping products, for which the old “80/20 rule” applies (i.e. 80% of the users use 20% of the features), this product has more of a 90/90 rule. If you are on the road, need to document your field trips, and be able to show where you have been, who you saw, the route you took, and tie it all to a contact database, this is the type of product you need. Another key feature for its targeted user group is the flat learning curve. For a $99.95 unlimited subscription, BusinessWebMap geocodes user-submitted databases (i.e. takes addresses and turns them into lat/long). BusinessWebMap may remind some of you of Esri’s old product, BusinessMAP. Bill McNeil, who developed and managed BusinessMAP for Esri, also created BusinessWebMap. There are three different map types. BusinessWebMap doesn’t just create a point map of ACT, Excel, dBase or CSV files, it can also represent database records as cluster and heat maps. These various map styles make it easy to visualize market penetration, coverage and competitive pressure (for presentation to decision makers). The maps can also be saved, printed, emailed and shared with others. One of BusinessWebMap’s most compelling features is its ability to add spatial query capabilities to the databases. It does the expected “find all records within 20 miles” or “between the first and last stop of a route” or within a defined geographic area. In addition, it can save the results of these queries and each time a spatial search is conducted, the numeric fields are summed. 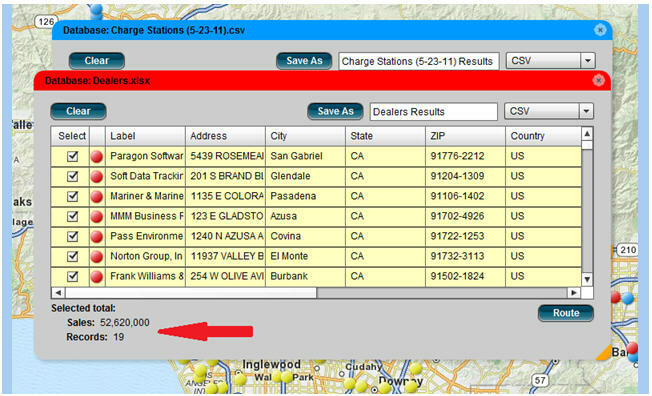 For example, if a geocoded database contains sales information and a spatial search polygon is drawn around an area, BusinessWebMap will not only display all records captured in the search but it will also render the total sales or other values (see red arrow on screen shot below). This could include any numeric value, such as population, hazardous waste sites, traffic counts, etc. Routing is another feature that makes BusinessWebMap significantly valuable to the road warrior. Once a spatial search is conducted, users have the option to get driving directions to each of the contacts found in the search. The number of stops is limited to 20 so this tool appears to be designed for daily routes. 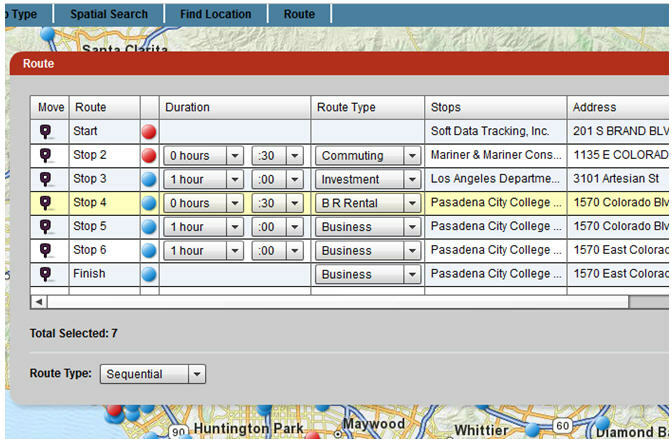 Users have the option of generating sequential or optimized routes and stops can be rearranged in the routing grid by dragging the icon in the Move column up or down. Each stop can be labeled Business or Personal, and the stop time duration can be selected. 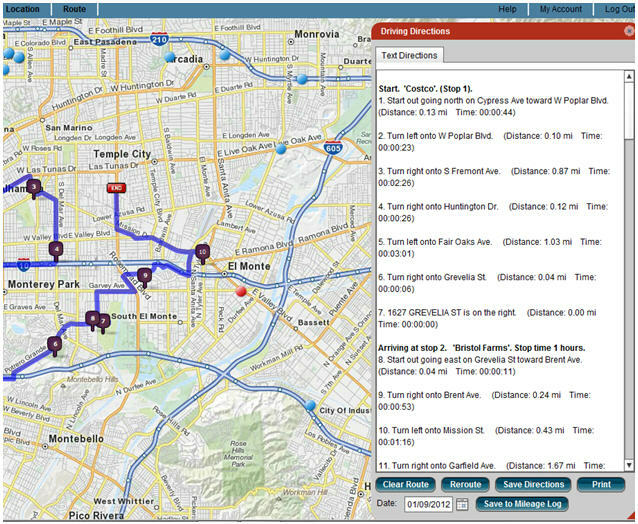 After the route is plotted and driving directions are generated, users can save that information as part of a permanent mileage log. Anyone tracking mileage for use as a business expense tax deduction would find this a valuable tool. It also provides an archived documentation of the trip. Another feature beneficial to the road warrior is the ability to integrate with other applications. While it easily imports and writes Excel, CSV or dBase files, at this point, it really only integrates with Sage’s ACT CRM application. This integration is accomplished via a plug-in. ACT is a program that is used by a large number of salespeople to manage their accounts. Through integrated with BusinessWebMap, files can be mapped and routes developed, and the data remain in ACT without any export or import functions. This is important for the ACT user because BusinessWebMap adds a spatial quality to ACT databases, allowing searches by location or distance. The plug-in also provides ACT users with the ability to select contacts for routing while in ACT (Route Tab) and create the mileage log as an ACT report (Mileage Log Tab). Two other features, which are part of the mapping system, are ideal for the road warrior. At the upper right-hand of the map window are buttons for traffic and to change the map to a satellite view. (The data come from MapQuest.) Naturally, if you are traversing a major metropolitan area, it would be nice to know where the congestion is and how to avoid it. This neat feature includes incident locations. The satellite view can provide a highly detailed visual guide to the location and how best to get there (showing which building is the actual stop). BusinessWebMap is an attractively priced Web service. It is highly targeted with an easy-to-learn, very functional set of solutions that use industry standard data. As in all software, there are some areas that could be improved. Among those are simple things, like adding the ability to change the symbols size and color on the fly, and more complex features, such as expanding the integration with ACT and other software. Yet you do have to consider the 90/90 rule of functionality. If you can use 90% of the functionality, spend a very short time learning the software and the cost is low, you probably can’t go wrong. 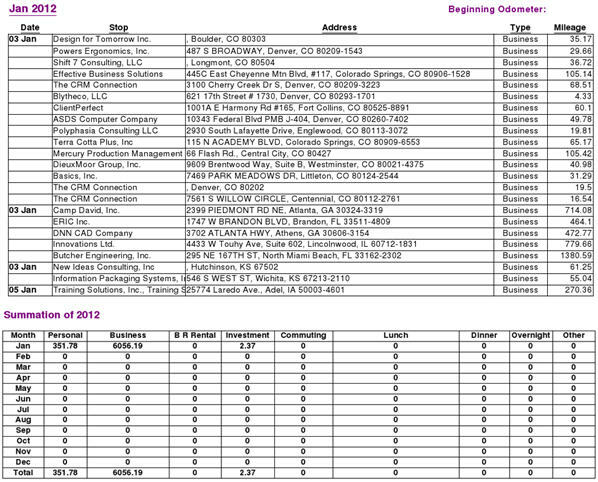 Disclosure: Hal Reid has performed several consulting engagements relating to TexMobile.